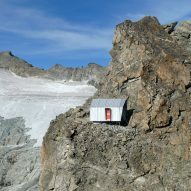 Italian architects and researchers Roberto Dini and Stefano Girodo have built a prefabricated shelter, named Bivouac Luca Pasqualetti, on the edge of a mountain peak in Valpelline, Italy. 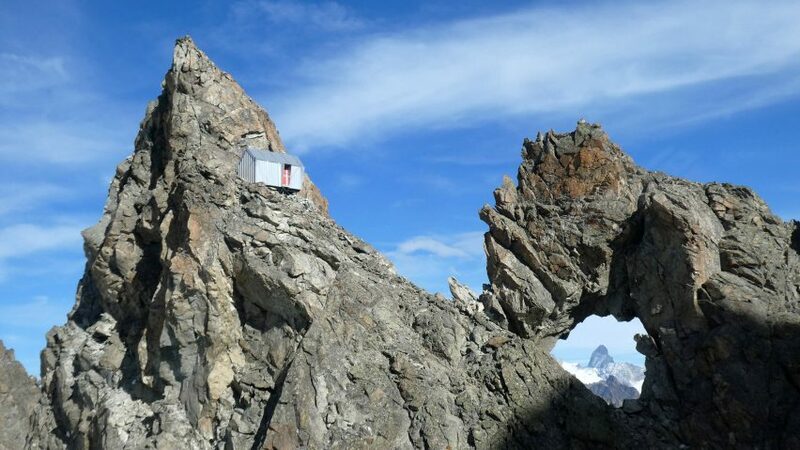 Located at an altitude of 3,290 metres in the Morion Ridge, the building was developed in collaboration with LEAPfactory for a group of local alpine guides who wanted to encourage exploration of "forgotten routes". 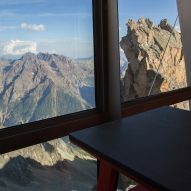 "The aim of Bivouac Luca Pasqualetti is to rediscover forgotten places by lightly improving their accessibility for mountaineering," explained architects Dini and Girodo, who are researchers at the Polytechnic University of Turin. 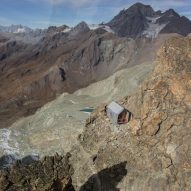 "A simple structure such as a bivouac, positioned in a remote place with a difficult access, is specifically conceived to encourage a niche alpinism." Dini and Girodo describe the shelter as an "extraordinary design challenge", due to its remote location and extreme weather, with temperatures dropping below minus 20 degrees celsius. 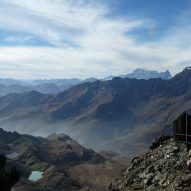 The prefabricated hut has a structure divided into four high-strength composite panels, made from wood and steel. These components were sized to reduce the overall number of helicopter flights needed for the final assembly – enabling the shelter to be constructed in one working day. 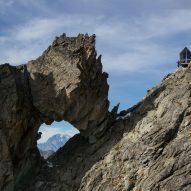 Slotted together, the panels form a small metal-clad hut with a pitched roof, which the architects designed to echo the jagged peaks of the Morion ridge. 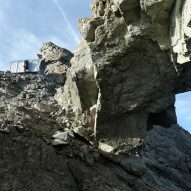 The building sits on temporary metal foundations, which are anchored to the rock face but can be removed at the end of its life without causing lasting damage. The entrance to Bivouac Luca Pasqualetti is positioned centrally to the structure, dividing the interiors into "day and night" spaces. It is set back within a frame that extends out around it to protect it from the wind and snowfall. Dini and Girodo lined the interiors with wooden panels to create a cosy aesthetic that contrasts with its protective shell. The daytime area has eight seats with a table for food preparation and storage compartments integrated into the wall. It has a glazed gable with panoramic views that enables sunlight to enter and warm the space. The nighttime area is positioned at the rear of the shelter, and has two platforms that accommodate eight beds. Bivouac Luca Pasqualetti is complete with a small battery-powered solar panel for lighting. In 2015, OFIS Arhitekti also took on the challenge of designing a mountain shelter that could withstand extreme weather. 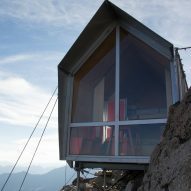 Developed in collaboration Harvard students, Alpine Shelter Skuta is a concrete clad structure that perches on a rocky outcrop in a Slovenian mountain range, and can accommodate eight mountaineers.